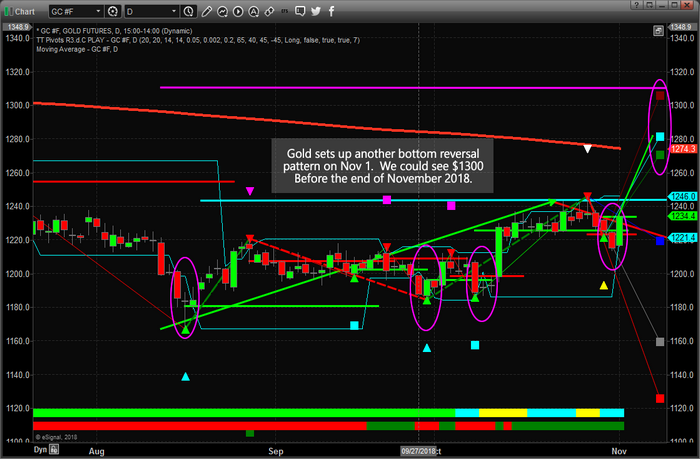 Gold Sets Up For A November 2018 Rally To Near $1300 – Technical Traders Ltd.
Today’s upside price move in gold, already up over $18 (+1.5%), sets up a real potential for a move to near $1300 before the end of November. We have been advising our followers that a strong potential for an upside move in the precious metals markets was likely and that a potential move to above $1300 was in the works prior to the end of 2018. Global economic concerns and the fact that global central banks are accumulating physical gold are putting pricing pressures on Gold and many of the other precious metals. This is a sleeper trade in many ways, the US equity markets and the US Dollar are much stronger than many expected. A true capital shift is taking place throughout the globe at the moment and many foreign nations and central banks are hedging risk by accumulating physical gold. When the price of Gold does really start to move higher, it could be an explosive move to the upside – just like what happened back in 2005~2008 and 2009~2012. Our predictive modeling systems are suggesting Gold could rally to above $1500 /oz in 2019 and we believe the current price levels are a gift for traders. Sub $1300 price levels may be the lowest prices we see for quite a while – don’t miss this opportunity to position your portfolio for this next move. Take a few minutes to read our most recent research posts about Gold, Oil, the Global Markets and the US Stock Market by visiting www.TheTechnicalTraders.com/FreeResearch/. Learn how we can help you find, execute and plan for greater trading success with our videos, books, proprietary research, and trading signals. Don’t be surprised to see the US stock market rally as Gold and Precious Metals rally as well. The current global economic environment is vastly different than what most traders are used to experiencing – which makes it even more opportunistic for skilled investors/traders. Learn how we can help you find greater success, visit www.TheTechnicalTraders.com.